Happy Summer! Yes, summer's finally here. Or so the calendar says. It's still feeling a bit chilly here in Michigan, but I'm optimistic that warmer days are on the way. They are, right?? Right ... ?? Yes. I meant to put the Froodles as breakfast and the smoothie below for lunch. 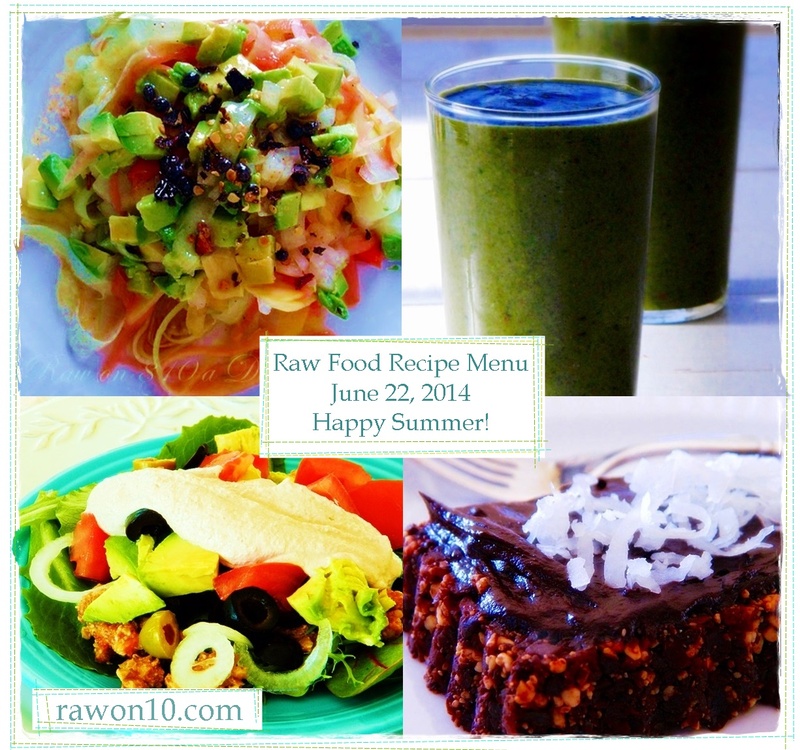 In my opinion, just like Fight Club but with better food, the first rule of RAW is "there is no rules." Want pie for breakfast? Have pie. Or Froodles. Peel and then shave, grate or cut the papaya, mango and cucumber into small, noodle like strips and arrange on plates (this is how I cut my noodles). Sprinkle on some finely diced onion , chopped avocado, crushed pepper flakes, and papaya seeds (they have a slightly peppery taste). Then, whisk together the lime juice, olive oil, agave, salt, and cayenne until emulsified. Spoon over the fruit noodles. I'm pretty sure I put just about everything I had in this, hence the name "(everything but the) Kitchen Sink Smoothie!" My blender is small and weak, poor thing (but has lasted forever), so I blend my greens first. If you don't have a VitaMix or other high powered blender, this might work better for you, too. They get pretty smooth if I process them for a minute or two. I also used Manitoba Harvest Hemp Pro 50, 50% Protein Powder, 32-Ounce which is my favorite hemp powder. Manitoba Harvest leaves all the good omega-3s intact. Just blend everything well until smooth and serve. 90% of Americans have at least some chocolate nearly every day, and it’s usually thought of as a guilty pleasure rather than a healthy indulgence. However, there are health benefits to be had from chocolate, especially when the unhealthy ingredients are left out. Chocolate has more antioxidants than blueberries, green tea, and red wine, and nearly eight times the antioxidants found in strawberries. Dark chocolate has been shown to lower high blood pressure and LDL cholesterol. Cacao contains antibacterial agents that fight tooth decay. By weight, cocoa powder has more protein than eggs. This is a great way to get some antioxidants and share a yummy dessert with a friend! In a food processor fitted with an "S" blade, process the cashews until finely ground and powdery (but not oily). Add the raisins, cacao powder, vanilla, and salt, and process again until the mixture starts sticking together. Press the brownie mixture firmly into the mold of your choice. I used a rectangular miniature tart pan with a removable bottom. Release onto a plate. For the frosting, stir together the coconut oil, agave, and cacao powder until smooth. 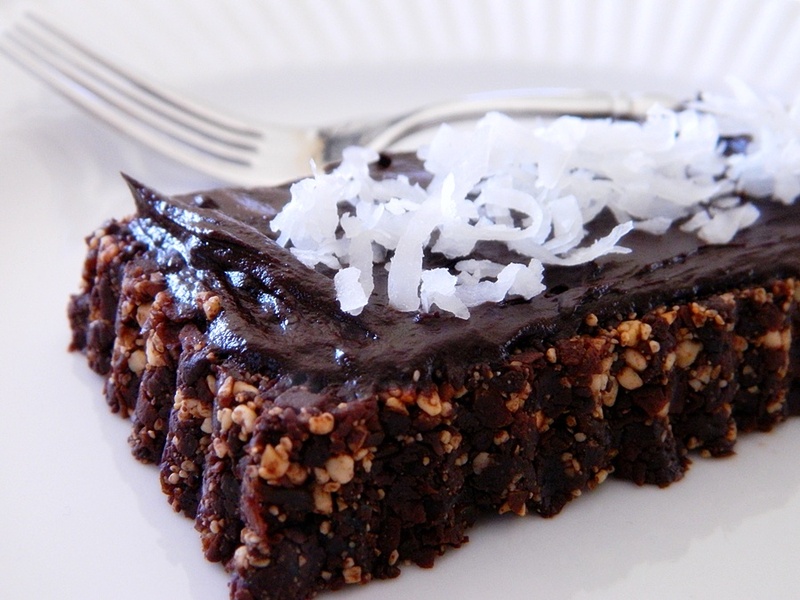 Spread on brownie and top with coconut flakes. Find a special friend to share it with! "There's nothing better than a good friend, except a good friend with chocolate." ~ Linda Grayson, "The Pickwick Papers"
How is the beginning of summer going in your neck of the woods? Leave a comment below. I'd love to hear from you! Hi, Lisa. Warmer days are on their way. That frosted brownie looks good!